As we hear more and more about automation, artificial intelligence and robots taking off industrial jobs, Parsable, a San Francisco-based start-up, sees a different reality, with Millions of workers for the most part bringing the digital transformation to their work. Parsable has developed a Connected Worker platform to help bring high-tech solutions to office-less industrial workers who have worked primarily with paper-based processes. Today, he announced a $ 40 million Series C cash injection to continue to build on this idea. The round was led by Future Fund with the help of B37 and existing investors Lightspeed Venture Partners, Airbus Ventures and Aramco Ventures. Today 's investment brings the total to nearly 70 million dollars. The Parsable solution works on almost any smartphone or tablet and is designed to enter information while walking around in environments where a desktop PC or laptop would simply not be practical. It means being able to type, drag and select easily in a mobile context. The challenge facing the company was the perception that these workers did not master the technology well. 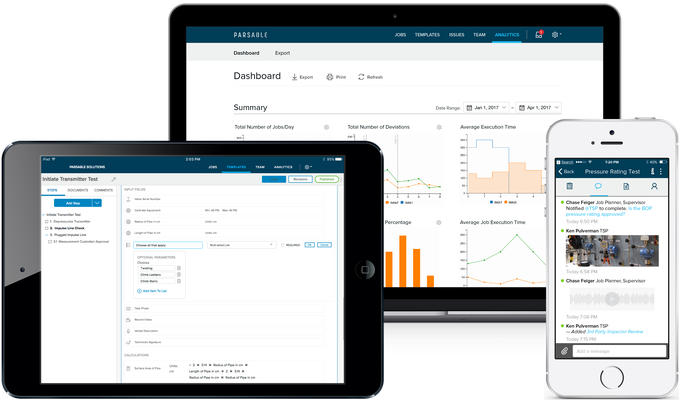 Parsable CEO, Lawrence Whittle, said the company, launched in 2013, had taken the time to build its first product because it wanted to give industrial workers what they really needed, and not not what the engineers thought they needed. This meant a long period of primary research. The company learned that it had to be simple to allow veterinarians in the industry who were at work for 25 years or more to feel comfortable at the same time. Use, while attracting younger, more sophisticated workers. The goal was to feel as familiar as Facebook or texting, common applications, even older workers used to use. "What we do is remove the [paper] notebooks for quality, safety and maintenance and provide a digital guide on how to capture work with the purpose of 39, increase efficiency. "Whittle explained. He compares this to the idea of ​​putting a sensor on a machine, but instead, they put that instrumentation into the hands of the worker. "We are actually putting a sensor on humans to give them the connectivity and the data to do the job in the same way as the machines," he says. The company also made the decision to make the platform flexible to add new technologies over time. As an example, they support smart glasses, which according to Whittle account for about 10% of his business today. But the founders recognized that the reality could change and they wanted to make the platform open enough to support new technologies as soon as they became available. Today, the company has 30 client companies with 30,000 registered users on the platform. Customers include Ecolab, Schlumberger, Silgan and Shell. They have about 80 employees, but expect to reach 100 by the end of the third quarter this year, says Whittle.